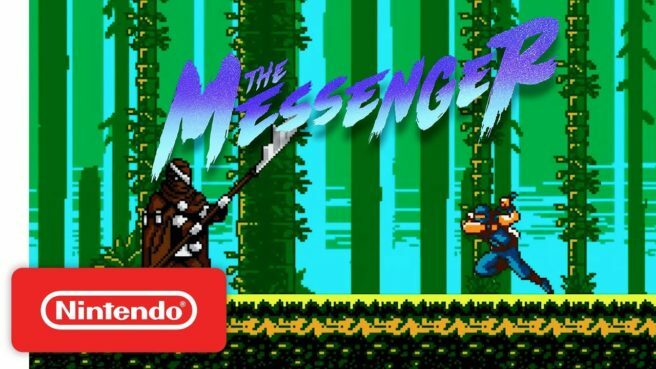 GamesBeat: Is The Messenger only a remix of Ninja Gaiden? Martin Brouard: Ninja Gaiden is obviously one of the inspirations. That’s the start, what we want the player to think at the start. But it has a lot of inspiration from other games of the retro era, both in 8-bit and 16-bit. The creative director has been collecting these games and playing them since he was young. He’s wanted to make this game since he was eight years old. It’s been evolving in his mind for many years. We started the company, Sabotage, and started doing this two years ago. We’re near completion. The idea is it takes all your fond memories of these games from the past. We want you to feel like you’re 9 years old again, playing with your friend in the basement and passing the controller. But with modern game design. We’re taking a lot of what we’ve learned in the past 30 years of game design. We want you to feel those memories, but with the controls of today. You’ve played it. You know the controls are very tight, very responsive. GamesBeat: It does play like I remember Ninja Gaiden playing. Martin Brouard: There’s a lot of tropes that we acknowledge early on in the game. If you read all the dialogues from the shopkeeper, there’s a lot of references to that stuff. It’s like a pact with the players. We know it’s cheesy. We know these are clichés. But let’s have fun doing this together and make fun of it at the same time. You’ll be laughing like when you watch a Deadpool movie and playing a cool action game that’s going to surprise you in many ways. Sometimes you’re not expecting a platformer to teach you life-affirming lessons. Sometimes the shopkeeper will go off on a long story. If people don’t care about that, they can skip through 90 percent of the dialogue and enjoy the pure action platforming. The game, later on, when it switches to 16-bit, it comes closer to a Metroidvania. Then you have to do all exploration. You need to go back to the previous levels and find hidden stuff that will help you get to the final true ending of the game. It moves from a simple 8-bit platformer to something else entirely. But you want to start at the beginning feeling like this is a classic platformer.